Is it time to work ON not IN your business and have a review? Are you too busy to review anything right now? You can’t review anything when Christmas is coming, with rush orders, last-minute jobs, staff holidays. Perhaps you have to do year end accounts. Anything else? Apart from that, you want to enjoy the Festive Season with family or friends, or to spend time alone. Anyway, you want to get away from work for a bit, and I hope you will. Will you start 2019 with a review? What have you planned for January? If it is ‘nothing’, will you just be reacting to whatever crops up? You might think you don’t need plans, because you just get on with business as usual. That’s not always a bad thing, but that’s working IN the business. When do you work ON the business? How can it go even better next year? Will you learn from them? What new products or services do you aim to introduce? Are you interested in efficiency, economy or effectiveness? See my article on the difference. How can you reduce costs or improve the product or service? When you’ve answered all those, it’s time to look at Risk Management. A man with a magnifying glass. Trying to review his business? How do you review Risk Management? Do you have a Risk Management process in your business? Are the risks the same now as last year? What about next year? Will the control measures in place be appropriate in future? Are any unnecessary or do you need any new ones? Reading my book, Load The Dice, could be a good start. Who will do the review? The business owner or general manager needs to be the primary reviewer, but others may need to get involved. At some stage you might need some input from an independent person, but they can’t be allowed to take over, unless they’re going to take over the business. If you want to chat about it, you know where to find me. When are you going to do your review? Some people find the time between Christmas and New Year is best, when there’s often a bit of quiet, unless you’re diving into the January Sales, starting Boxing Day. Otherwise, try to set time aside in January, before you find circumstances taking over. Put yourself in charge. What will I review in my own life? I will review my pricing strategy, and the way I spend my time on different projects. 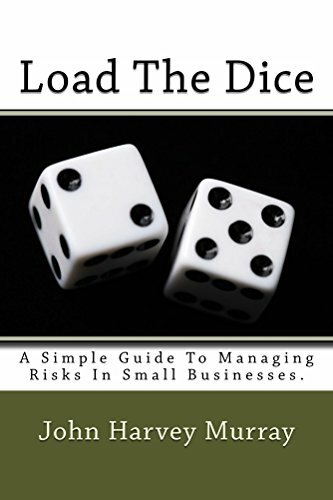 I also hope to review some of my books, such as Load The Dice, because I may be producing updated versions. Stakeholders – the key to your business and to Brexit. You might still benefit from reflecting on what I did say in that post. You might also like to have another look at something I wrote about consulting, which sometimes is similar to negotiation, and should involve stakeholders. I referred to the Brexit process as an example. I am doing so again: an example of how not to do it. Mrs May has ignored key stakeholders. The PM should have especially considered the Scots, Welsh and Ulstermen – not just the DUP, as the province voted Remain, whilst the party is for Leave. St Andrew’s Cross. Scotland is one of the UK’s key stakeholders. How could other stakeholders have been involved? The PM should have convened a group consisting of members of all the other political parties, before triggering Article 50 and established as much consensus as possible. Even where they disagreed, the others would at least have felt she had listened to them. Mrs May could have consulted the group at various stages of the negotiations. The EU would then have been aware that they were negotiating with the UK, not just with the present minority government. What difference would involving other stakeholders have made? It might have strengthened the PM’s hand in her dealings with the EU . Other stakeholders might have accepted the necessity for waiving some of their red lines. The PM might not have found herself so isolated in Parliament and beyond. OK these are three ‘mights’ but seeing how things are now, wouldn’t it have been worth trying? Do you negotiate only with clients? What about others with a stake in your business? Do they come into consideration only when there is a row, or do you let them in at stage 1? Don’t find yourself in a Brexit without a paddle – ask your stakeholders!